Some days it's simply too cold to go out and enjoy the snow. On those days when you're stuck inside, why not enjoy the beauty of snowflakes indoors? 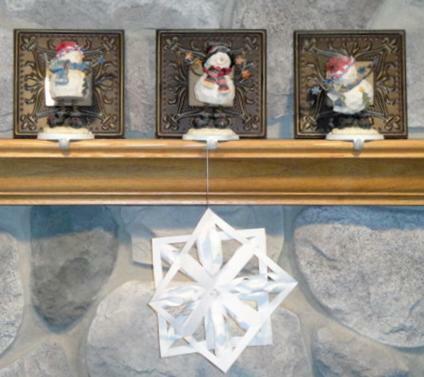 Here's an easy project from our Winter 2010 issue: a new 3D twist on the classic paper snowflake. 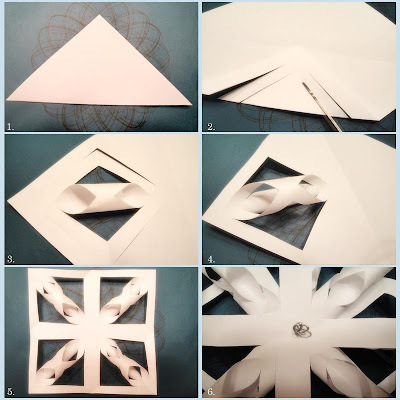 1) Fold paper corner to corner to make a triangle. 2) Open folded triangle and fold outside corner to center. Make 2 cuts along each edge as shown. The ones shown here are about ½” (ca. 1,25 cm) apart. You could also choose to either add more cuts – in that case a larger square is recommended - or to bring the cuts closer to each other. Either way, the cuts on either side should run parallel to each other. Make sure though to not cut all the way – you still want the individual pieces to stay attached to the main body of the square. 3) Open folded triangle. Bring edges of smallest square together and tape. 4) Flip the square over and pull next smallest square edges together, tape. Repeat steps 2 – 4 for each corner. 5) After all four corners are done your paper should look like this. Repeat steps 1 – 4 for your second paper square. 6) Lay one square on top of the other and twist so that all 8 3-D spindles are showing. Secure in the center with a staple or wire. I used wire and kept it long so I’d have a way to hang it.